Collectibles - U.S. Consoles! - The Odyssey² Homepage! 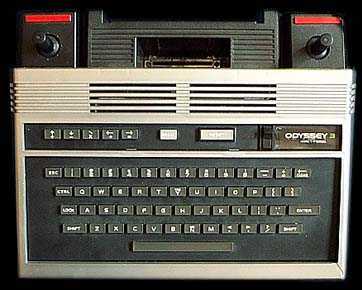 There are actually several types of Odyssey² consoles (also known as "mainframes") released in the United States. A number of variations are already known, but there yet may be more. Two different console box types exist as well. 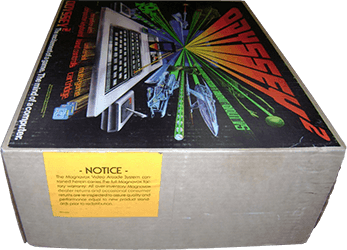 The earlier box says "The Ultimate Computer Video Game System... By Magnavox" on its top; the later edition features the slogan, "The Excitement of a Game... the Mind of a Computer!" The A/C adapter connects via a jack in the back of the console. The jack may be male, in which case it is compatible with a standard Nintendo Entertainment System (NES) power supply, or female, it which case it is not NES-compatible. 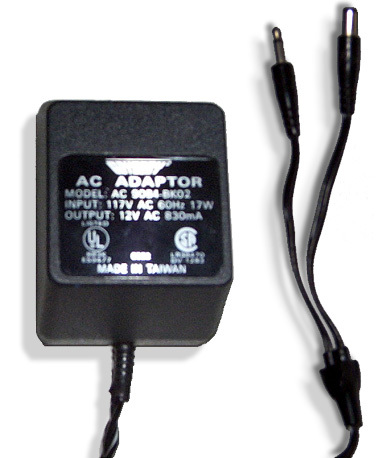 The adapters themselves come in three basic varieties: female plugs (NES compatible), male plugs (not NES compatible), or the rare dual-tipped adapter, which contains both male and female plugs. 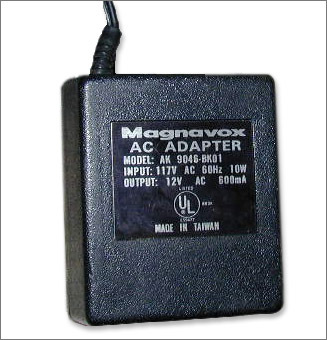 It is possible that the dual-plug adapter was only provided by Magnavox as a replacement part. 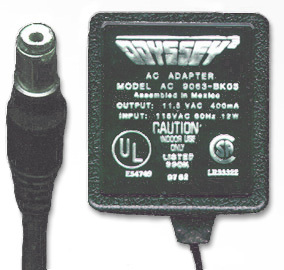 Some adapters have the Odyssey² logo printed on them; others only say "Magnavox AC Adapter." For photos, see the chart. The various models can have hardwired black joysticks, detachable silver joysticks, detachable black joysticks, or Command Center-style joysticks. NOTE: If you open the casing of a console with hardwired joysticks, you'll find that the sticks attach via a molex-type connector, and can be removed. Detachable joysticks have standard 9-pin connectors, but are not compatible with standard (Atari 2600 and Commodore) joysticks. Keyboards can be smooth, with a shiny laminated look and feel, or rough and unlaminated. The smooth keyboards are preferable, because the print on the rough keyboards will wear away with heavy use. 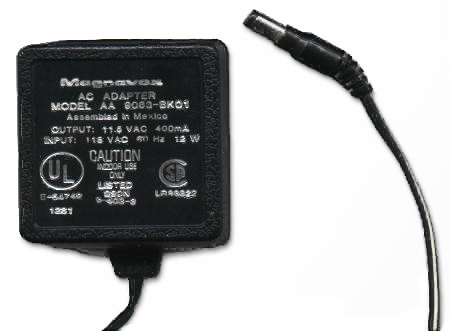 The hardwired cords that connect the console to a television can have standard (RCA) jacks or non-standard, 1970s-style jacks. The non-standard jacks require special switchboxes which are no longer manufactured. If your console has a non-standard cable, it's a simple matter to swap it out for a standard RCA cable. Instructions are available on Ozyr's Classic Video Game Emporium. 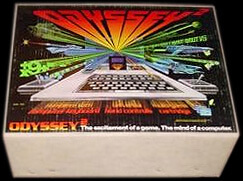 The Odyssey² logo on the console's upper left-hand corner may be flat (stenciled directly on the console), or on a raised plastic rectangle. 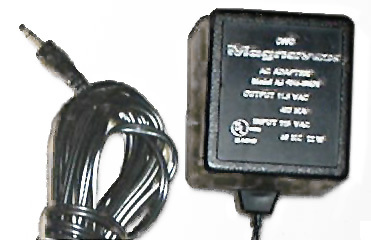 The consoles with flat logos also have the word "Magnavox" printed above the power button; the raised logo consoles do not. 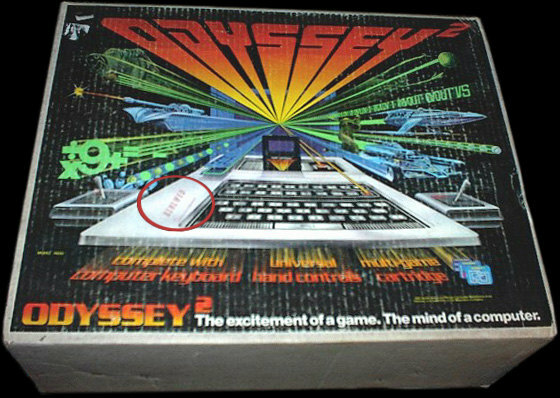 * The Odyssey² console with Command Center joysticks is by far the rarest style out there. It features hardwired (molex-style) controllers. These are black, thicker plastic sticks with one long red "fire bar" across the top, instead of the smaller "ACTION" button. Jayson Hill says he has found many of these consoles in the Knoxville, Tennessee area (Philips' U.S. headquarters), and I've heard from one other player who claims to have seen one back "in the day." To date, I've never seen an actual console, or even a photo of one. My suspicion is that they are unreleased engineering prototypes. Presumably these are consoles that were modified by Magnavox service centers, probably to replace their broken hardwired controllers with detachable 9-pin ports. 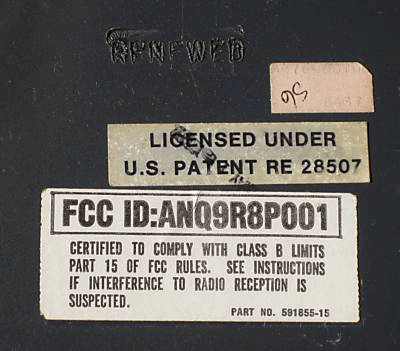 Some renewed consoles have the word RENEWED stamped on their undersides and on the box they come in. Unlike regular console boxes which are fully printed in color on all sides, Renewed console boxes are a plain whitish brown, with only a partial color label on top. Some renewed console boxes have a yellow warranty sticker affixed to one side. Dennis Gruchala reports that the berths for the joystick ports on his renewed console appear to have been cut out, and the ports themselves have the appearance of replacement parts and are labeled with the letters AMP. Enhanced Odyssey² games - These games are identical to their Odyssey² counterparts, only when played on a Command Center, they would display beautiful ColecoVision-quality backgrounds. These enhanced carts would also function in normal Odyssey² units, only without the special backgrounds. Command Center games - All-new games designed to take advantage of the Command Center's advanced capabilities. These games will not function on a standard Odyssey².